BabyIn BabyOut project, which she founded last summer and recently helped bring to Goochland. In response to a rise in infants and young children dying after being forgotten in hot vehicles, Rhudy worked with a graphic designer to create brightly colored hangtags for parents and caregivers to use in their vehicles. The tags are designed to be hung from a vehicle’s rearview mirror and flipped over whenever a child is placed in, or removed from, the vehicle. Hannah Rhudy, left, and Goochland Sheriff Jim Agnew display the hangtags she created to help prevent parents and caregivers from leaving children in cars. • Living room • Dining & kitchen • BeDroom • entertainment • office • rugs • accessories! welcomes Dr. Michael Marotta to its Goochland office. Dr. Marotta brings a wealth of experience after completing a two-year residency at the University of Virginia Hospital. Goochland County Animal Protection will be hosting a Rabies Clinic from 2 to 4 p.m. on Sunday, April 7, on the corner of Sandy Hook and Fairgrounds Road. The cost to take part in this clinic is $10 per animal (cash or check only), and all pets will receive a 1-year vaccination unless a previous rabies certificate id provided for a 3-year booster shot. All proceeds from this event will benefit the Goochland Animal Shelter. For more information, call (804) 556-5302.
to the east, with project completion projected for the first week of May. Fire-Rescue’s Training, Health & Safety Officer Chan Rowland will be coordinating this year’s project and may be contacted at (804) 385-3168 or crowland@goochlandva.us. able at the sheriff’s office for anyone who would like one. Rhudy has also partnered with a number of other outlets, including KidMed Pediatric Urgent Care centers and several area law enforcement agencies. Her long-term vision for the project, she said, is to work with engineers to explore a tech solution or sensor system that will help alert parents that children are in the back seat of a vehicle. Please call our office today. We look forward to meeting your dental health needs. Goochland Gazette, Attn: Subscription 8460 Times-Dispatch Blvd. Mechanicsville, VA 23116 Cash and checks accepted at the above address or call to give credit/ debit card over the phone. port the community in whatever ways make the most sense.â&#x20AC;? Both women drew attention to the wide range of resources GPCS represents for the community. It is best known for being a resource and a service provider for people with mental health, intellectual disabilities and substance use disorder service needs, Bergquist said. It also has programs focused on community education, prevention efforts and infant intervention, Gill said. Treatment, rehabilitative, and support services are provided to consumers and family members to help them live a full life in the community. Throughout her career, Bergquist saw many changes in the services GPCS provided and in the facilities, including building relocation, expansion and downsizing in both counties, implementation of electronic health records, staff expansion, and vast changes in the needs of the consumers, according to a proclamation that the Powhatan County Board of Supervisors unanimously passed in her honor on Monday, Jan. 28. In her various roles through the years, Bergquist â&#x20AC;&#x153;served the employees of GPCS tirelessly, remaining a constant source of support to be counted on, through a roller coaster of changes in Virginiaâ&#x20AC;&#x2122;s mental health system,â&#x20AC;? the proclamation said. Implementation of electronic health records was a major undertaking that ultimately had a very positive impact on overall efficiency of GPCS in terms of staff time and capturing insurance reimbursement to maximize resources available for the agencyâ&#x20AC;&#x2122;s consumers, said Angela Cimmino, chairwoman of the Goochland Powhatan Community Services Board. Advertise In The Goochland Gazette! Call 804-746-1235 for details. Zoning Appeals from 1975 to 1985. He enjoyed traveling and golfing with his wife, June, where they were members of Hermitage Country Club. Family received friends and guests on Thursday, March 28, at Bennett Funeral Home in Glen Allen, where funeral services were held Friday, March 29. Interment Westhampton Memorial Park. In lieu of flowers, donations can be made to Salem Baptist Church Building Fund. Club. On Saturday, April 6, club members will be taking donations to help support sight-related endeavors in our community. Look for Lions members at the two Food Lion locations in Goochland and ”Help Us Help the Blind.” Club members will also be collecting used eyeglasses to be recycled for those in need. (804) 457-4495 Hours: M-F 8am-6pm • Sales after hours by Appt. Students from Andrea Cachina’s second grade class at Goochland Elementary School helped plant one of two pinwheel gardens at the Goochland Library to celebrate strong families. The pinwheel gardens are supported locally by the GFWC Goochland Woman’s Club to help raise awareness of child abuse prevention. The pinwheel symbolizes childhood hope, health, and happiness. Pinwheel gardens are part of the national Pinwheels for Preventation campaign of Prevent Child Abuse America and April is National Child Abuse Prevention Month. for Magellan of Virginia in Glen Allen; provided psychotherapy in a private practice setting; was adjunct faculty in the School of Social Work at Virginia Commonwealth University, and worked in various positions for Henrico Area Mental Health and Developmental Services, including program manager, clinical supervisor, and the Program for Assertive Community Treatment’s team leader and program development supervisor. Cimmino said that in her most recent position, Gill provided leadership and management of behavioral health community services offices and staff; liaised between agency and community providers; managed a $300 million budget, and managed a number of projects and programs. “Stacy is a 30-year veteran of the public health care sector, with 26 years of experience working for three different community service boards in a variety of clinical and administrative positions,” Cimmino said. sion across the state. “Stacy’s depth and breadth of experiences and leadership roles in the public health care arena at both the community and state level make her uniquely qualified to lead GPCS through these times of change, maintaining, strengthening and expanding the mental health, developmental disabilities, and substance use disorder services provided to the residents of Powhatan and Goochland counties,” Cimmino said. Laura McFarland is the news editor of the Powhatan Today. ing any one visit per day. According to attorney Darvin Satterwhite, who is representing Brockenbrough, the tasting room will not be a major part of the operation and is expected to be open from 1 – 7 p.m. on Thursdays, Fridays and Saturdays. After asking several questions about concerns that had been raised in a public meeting earlier this year — including those about signage and the proposed distillery’s impact on surrounding properties — commissioners recommended the project be approved by the county Board of Supervisors. The distillery is expected to employ two people and produce primarily whisky, bourbon, gin and vodka. Recent Property Transfers 1 acre; Glenn E. Adams to Joshua L. Carter, $160,000. 10.02 acres; EDOS LLC to Ryan J. Brown, $262,500.  13.14 acres; Amin K. Rayess to Aurelie M. Gouverneur, $210,000. 2 acres; Christopher B. Davis to Christie Deas Evans, $175,000.  71.13 acres; Freas Co. LLC to Mark L. Smith, $419,410. Lot 5, Block A, Sectin 1, River Oaks; Nina E. Patton to Rebecca H. Seidenberg, $180,000.  Parcel; Dolores G. MacMillan to Mark L. Nold, $340,100. Gum Spring United Methodist Church is offering free coffee and donuts on the first Thursday of every month, from 6:30 to 8:30 a.m. This is a drive thru event, with no need to get out of the car. The church is located at 191 Cross County Road, in Gum Spring (the big brick church near Rt. 250 off of 522. The Mizpah Faith Walkers Relay For Life of Goochland team invites all to join them from 11 a.m. to 2 p.m. at Bowl America Short Pump as they aim to Strike Out Cancer. Those who wish to participate are asked to register their teams by March 15. All ages and bowling skill levels welcomed. In addition to bowling, there will be a Silence Cancer Silent Auction, 50/50 Cash Chances, Wishing Wells, Spin the Wheel opportunities, Purple Ribbon Bake Sale, Luminaria Recognitions, and more. All are welcome, even if they do not bowl! For more information, see the Relay For Life web site at www.relayforlife.org/goochlandva. Relay For Life of Goochland planning committee and team captains will meet at 6:30 p.m. at the Providence Presbyterian Church Preschool Building, 3388 Three Chopt Rd, in Gum Spring. For more information, visit www.relayforlife.org/ goochlandVA or contact Tracie Grady, 2019 Relay For Life of Goochland Event Lead, at TracieGrady@gmail.com. Grace Episcopal Church, located at 2955 River Road West in the Goochland Courthouse, will be hosting a service of healing prayer and communion at 5 p.m. This is a monthly service offered to the Goochland community every second Saturday and all are welcome. For more information call (804) 556-3051 or visit our website at www.gracechurchgoochland.org. Friday, April 5 The Rotary Club of Goochland will welcome guest speaker Ken Peterson, who is on the Goochland County Board of Supervisors. The meeting starts at 7:30 a.m. at the Richmond Country Club and all are welcome. The Rotary Club of Goochland will welcome guest speaker Tim Hightower, former NFL player. The meeting starts at 7:30 a.m. at the Richmond Country Club and all are welcome. Contact me today to schedule a showing. h, spring, that time of year when the lovely Goochland landscape becomes dotted with brilliant colors, and everywhere you look there are hints about what is to come. I’m speaking here, of course, about campaign signs. For the record, I have absolutely nothing against campaign signs. where the right to cast our ballot for whomever we choose is sacrosanct. Sadly, however, things can go awry. While the established laws on political signs expressly prohibit certain behaviors (including posting on public property), there are a number of other ways to run afoul of common decency. A few things for candidates to bear in mind when staking signs: First, please don’t use valuable sign space to bash your opponent. this, though not in Goochland). Finally, to those who find themselves so fervently opposed to a candidate that they consider removing a campaign sign from someone else’s property, please be advised that this isn’t just bad behavior — it’s a crime. Though November still feels like a long way off, the campaigns are already gathering steam. Here’s hoping our signage stays civil, and our reputation as a community where people respect one another remains intact. The clerk told me the real confirmation of the nearly lost art lay in a group of tape recordings, made in the 1950s and 1960s, of actual locals displaying their hollering skills. Fearing the art would go the way of the rotary phone, and needing to raise funds for the local fire department, residents and local historians began the festival in 1969. So, what exactly is involved in a hollerin contest? Precisely what you would imagine. Contestants are grouped by gender and age and take turns on the stage screaming into a microphone, yelps the clerk claimed could be heard for miles. Throughout the 1970s, the contest in 1969, a number of the old-timers grew in popularity and winners reguwith iron lungs dominated the com- larly appeared on late night television petition. to display their trophies and talents. WE WANT TO PUBLISH YOUR ISSUE-DRIVEN LETTERS The Local welcomes your signed letters to the editor on topics of interest to Goochland residents. Letters must include your address and a daytime telephone number. We reserve the right to edit letters. We do not guarantee that every letter received will be published. Letters reflect the opinions and positions of the writers and not The Goochland Gazette. Send letters to: The Goochland Gazette 8460 Times-Dispatch Blvd. Mechanicsville, Va. 23116 Fax: 730-0476 E-mail: editor@goochlandgazette.com © 2019 by Richmond Suburban Newspapers. All advertising and editorial matter is fully protected and may not be reproduced in any manner without the permission of the publisher. CAC Audited Circulation: 8,014. As the years passed, so did the old-time hollerers and the event transitioned to a heritage type festival and the hollerin event took second fiddle to more traditional festival offerings. Most of what I learned at that tiny college in North Carolina I’ve forgotten, but that picture in my mind of bearded old men screaming at the top of their lungs on that porch never left me. In 2016, interest in the contest was almost non-existent and efforts to interest younger generations to enter the competition met with little success. It seems kids are much better at yelling at each other than actually putting the skills on the line to be scored. The contest was actually costing the local fire department money, and, sadly, the event was cancelled … and Spivey’s Corner went silent. And I suppose few will lament the loss of the Hollerin Contest as I recall its formation more than 50 years ago. But there’s something special in those tapes donated by Erman Godwin back in the ’60s, and the sound of farmers calling cows somehow is meaningful enough to remember in a world where most kids have rarely seen a farm. And who said silence is golden? Goochland Girls Soccer’s Jill Flammia (#8) controls the ball in the Bulldogs’ March 27 home match versus Bluestone. Flammia, a freshman, would score the go-ahead goal late in the first half during the Bulldogs’ 2-0 victory over Bluestone. their opponents 11-0. Manno noted that his team’s still getting into shape and working on some tactics in preparation for the rest of the regular season, which will resume April 8 at Randolph-Henry. spoke to the importance of the team needing to finish. The day before Wednesday’s win, Willms delivered a hat trick while Moyer and Vincent each scored once in Goochland’s 6-2 road triumph over Amelia. “It pretty much is putting them in different situations so they can be able to finish maybe one-on-one on the goalkeeper instead of trying to finish from far away,” Lopez said. “We’re finding out their abilities and making it happen in the field, that’s what we’re trying to do.” Goochland returns from Spring Nick Vandeloecht/Goochland Gazette Break to play at Randolph-Henry April Goochland Boys Soccer’s Caleb Moyer (#12) watches his second goal of the day go into the net in the Bulldogs’ 5-0 win over Bluestone. 8, then host Prince Edward April 10. Left: Goochland Girls Track and Field’s Kennedy Carter competes in the 110m high hurdles at Goochland High School; right: Goochland Track and Field’s Zella Warner (right) and Brandon Avram compete in the 4x800m relays. won the 4x800m relay on a 10:47.2. Behind Cumberland and Goochland in the competition for the boys, Bluestone scored 46 points and Randolph-Henry finished with 16. Behind Goochland in the girls’ competitions, Bluestone finished a distant second with 34 points, followed by Cumberland with 27 and Randolph-Henry with 11.
a junior, was selected to Second Team All-State. Two of Goochland’s leading scorers this season, both Harwood and Snead factored into the Bulldogs’ historic run to the Class 2 state semifinals - the furthest the Goochland Boys Basketball program has ever gone. Both players were a part of the Bulldogs’ 2019 Region 2A Championship, as well as the James River District tournament and regular season championships. PRO CORNER Opening day statement made ST. PETERSBURG, Fla. - 2017 World Series Champion and Goochland High School alum Justin Verlander won the battle of aces on MLB Opening Day. He overcame allowing an early earned run to pitch a 1-run, 1-walk, 3-hit day over 7 innings with 9 strikeouts in his Houston Astros’ 5-1 victory over reigning Cy Young Award winner Blake Snell and the Tampa Bay Rays. Quincy Snead (left) and Deion Harwood help cut the net after helping Goochland win the regional championship on Feb. 22, 2019.
contest and their sixth game in 2019 with a double-digit run total. The Cadets this year have also defeated Walsingham Academy 3-2, Norfolk Christian 1-0, Bishop McNamara (MD) 6-3, Archbishop Spalding (MD) 11-0, St. Anne’sBelfield 13-0, Altoona (PA) 6-2, Flint Hill 11-0, Stafford 9-3, Trinity Episcopal 14-0, Woodberry Forest 9-2, and Potomac 12-1. (301) 5 (:10) ››› Shanghai Knights (2003) Jackie Chan. (:15) ››‡ Black Widow (1987) Debra Winger. ›› Alvin and the Chipmunks (2007) Jason Lee. ›››‡ Black Swan (2010) Natalie Portman. ››› Men in Black (1997) Tommy Lee Jones. ›› Pearl Harbor (2001) Ben Affleck. Best friends become fighter pilots and romantic rivals in 1941. (56) W ››› Men in Black (1997) Tommy Lee Jones. E NBA Basketball: San Antonio Spurs at Washington Wizards. (13) 4 ››› Go (1999) Desmond Askew, Taye Diggs. (:45) ›› Bedtime Stories (2008) Adam Sandler. ››‡ Man of Steel (2013) Henry Cavill. ›› The Change-Up (2011) Ryan Reynolds. ››› Ice Age (2002) Voices of Ray Romano. (12) , PGA Tour Golf: Valero Texas Open, Third Round. (39) I (3:30) ››› Friday (1995) Ice Cube. (56) W ›› Pet Sematary Two (1992) Edward Furlong. Judge Judy Judge Judy Two Men News Chicago P.D. ’ Paid Prog. (12) , PGA Tour Golf: Valero Texas Open, Final Round. (33) < (3:05) ››› Iron Man (2008) Robert Downey Jr..
Easy Yoga: The Secret Call the Midwife Å Mrs. Wilson ›››‡ Marvel’s the Avengers (2012) Robert Downey Jr..
(37) = (3:00) Live PD Riding along with law enforcement. ›› The Hangover Part III (2013) Bradley Cooper. ››› Blockers (2018) Leslie Mann. Articulate Wait ... Midsomer Murders Doc Martin All My Trials Grantchester PBS NewsHour (N) ’ Law & Order: SVU WWE SmackDown! (N) ’ (Live) Å Miz & Mrs Growing Up Mod Fam Mod Fam NBA Basketball: Boston Celtics at Washington Wizards. Å NBA Basketball: Houston Rockets at Oklahoma City Thunder. Big Bang Big Bang Big Bang Big Bang Big Bang Big Bang Big Bang Last O.G. Conan (N) Last O.G. ›› The Nun (2018) Demián Bichir. Odd Squad Cyberchase News Business PBS NewsHour (N) ’ Nature (N) ’ NOVA ’ Å Ozone Hole Song of the Mountains Doc Martin All My Trials Amanpour and Company Rudy Maxa Inside-Out Call the Midwife (N) ’ Mrs. Wilson Unforgotten PBS NewsHour (N) ’ Law & Order: SVU Law & Order: SVU NHL Hockey: Conference Quarterfinal: Teams TBA. (N) (Live) Å Law & Order: SVU Law & Order: SVU UEFA ›› Deep Impact (1998, Drama) Robert Duvall, Tea Leoni. Å ››› Edge of Tomorrow (2014) Tom Cruise. Å (DVS) ››‡ RoboCop (2014) Joel Kinnaman. (:03) ›› Failure to Launch (2006) Å Lucky One ›››‡ The Fugitive (1993) Harrison Ford. Native Son (2019) Margaret Qualley. Wyatt Cenac, Problem (:20) Veep (10:50) ›‡ Breaking In (2018) ’ ›››‡ Darkest Hour (2017) Gary Oldman. (:05) ›› Head in the Clouds (2004) ’ ‘R’ Å Legend ‘R’ ››› O Brother, Where Art Thou? (2000) George Clooney. CLASSIFIEDS: Call (804) 746-1235 x 2 to place an ad. POWER WASHING Affordable Quality Wash Houses, Decks & More! Lic & Ins. Call 804-550-2345 /873-5125. Serving Goochland for over 22 years. Angie’s List Highest Rating! 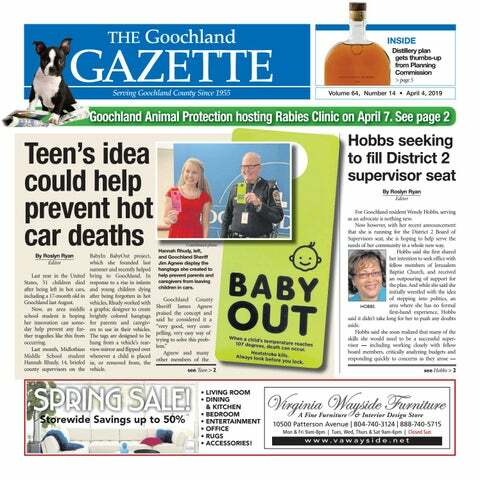 ADVERTISE Advertise with The Goochland Gazette Call us at 746-1235 or Toll Free (877) 888-0449 to ﬁnd out about opportunities to advertise in The Gazette! Recruitment ADMIN. & OFFICE WORK ADMINISTRATIVE SERVICES ASSISTANT - Permanent Part Time (25 hours/week) to provide clerical services for Goochland Powhatan Community Services. Experience with standard office software, electronic health record and knowledge in insurance billing is preferred. Starting salary $17,199. For a complete job description and application, please visit www.gpcsb.org or call 804-556-5400. Deadline 4/15/19. EOE. HEALTHCARE EMERGENCY SERVICES SUPERVISOR Goochland Powhatan Community Services is seeking a full time ES Supervisor who is a licensed mental health professional and a certified prescreener w/minimum two years of experience working in ES, or w/persons with serious mental illness. Regular work hours are M-F 8a-4:30p with minimal afterhours responsibilities. See www.gpcsb .org for details & application. Open until filled. EOE. TRANSPORTATION DRIVERS - Part-time. Goochland Powhatan Community Services is seeking drivers to transport individuals to and from facilities in Goochland & Powhatan Counties. Qualified applicants must be 25 yrs. or older. Must be able to work with people, and work morning hours & late afternoon hours. A valid VA Driver’s License w/ a good driving record, pre-employment drug screening, and criminal background check required. $10.14/hour. Call 804-556-5400 or visit www.gpcsb.org/Job-Opportunit ies for job description and application. Open until filled. EOE. Respondent(s). ORDER OF PUBLICATION The object of this suit is to enforce the lien of the Complainant, County of Goochland, Virginia, for delinquent real estate taxes against certain real property located in the County of Goochland, Virginia, described as follows: Tax Map No. 39-1-92 Account No. 3071 All that certain piece or parcel of land lying and being situated in the Lickinghole Magisterial District of Goochland County, Virginia, near St. Paul’s Church, and containing fifteen (15) acres, more or less. The courses and distances of the boundaries of which are as follows: Commencing at a point in the center of State Highway which runs from St. Paul’s Church to Route # 6, opposite a stone and cedar pointer where the lands of the Wright tract and this tract intersects. Thence S. 35 degrees E. 730’ along a wire fence and chops to a Dogwood, thence S. 15 degrees E. 560’ along a wire fence and chops to a Spanish Oak, thence N. 88 degrees W. 930’ to a point in the center of the said State Highway opposite a stone and persimmon pointer, thence along the center of said Highway N. 18 degrees E. 1190’ to the point of beginning. It being bounded on the northeast by the Wright tract, on the south by the land of Herman Sims, and on the west by the Right-ofWay of State Highway leading from St. Paul’s Church to Route # 6 and the land of Henry Woodward. 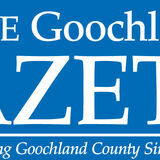 Advertise with The Goochland Gazette Call us at 746-1235 or Toll Free (877) 888-0449 to ﬁnd out more! 8 temporary farmworkers needed for common ﬁeld labor in corn, cotton, soybeans, tobacco, and other diversiﬁed crops in Lenoir County, North Carolina, for Faulkner Farms, LLC with work beginning on or about 06/01/2019 and ending on or about 11/01/2019. The job offered is for an experienced farmworker and requires minimum 1 month veriﬁable work experience in the crop activities listed. The minimum offered wage rate that workers will be paid is $12.25 per hour. Workers must commit to work the entire contract period. Workers are guaranteed work for 3/4 of the contract period, beginning with the ﬁrst day the worker arrives at the place of employment. All work tools, supplies and equipment are provided at no cost to the worker. Housing will be provided to those workers who cannot reasonably return to their permanent residence at the end of each working day. Transportation and subsistence will be provided by the employer upon completion of 50% of the work contract, or earlier, to workers who are recruited outside the area of intended employment. Applicants must provide documentation that they are eligible legally to work in the United States. Applicants should report or send resumes to NCWorks Career Center – Lenoir County, 231 Hwy. 58 South, Kinston NC 28502, (252) 775-6021, or the nearest local ofﬁce of their State Workforce Agency, and reference job order #NC11055500. EOE. H-300-19078-832639. 16 temporary farmworkers needed for common ﬁeld labor in blackberries in Pender County, North Carolina, for Slocum Trail Farm, LLC with work beginning on or about 05/13/2019 and ending on or about 08/15/2019. The job offered is for an experienced farmworker and requires minimum 3 month veriﬁable work experience pruning ﬁeld-grown blueberry plants. The minimum offered wage rate that workers will be paid is $12.25 per hour and piece rates may be offered depending on crop activity. Workers must commit to work the entire contract period. Workers are guaranteed work for 3/4 of the contract period, beginning with the ﬁrst day the worker arrives at the place of employment. All work tools, supplies and equipment are provided at no cost to the worker. Housing will be provided to those workers who cannot reasonably return to their permanent residence at the end of each working day. Transportation and subsistence will be provided by the employer upon completion of 50% of the work contract, or earlier, to workers who are recruited outside the area of intended employment. Applicants must provide documentation that they are eligible legally to work in the United States. Applicants should report or send resumes to NCWorks Career Center - Pender County, 904-A S. Walker St. Burgaw, NC 28425, (910) 2590240, or the nearest local ofﬁce of their State Workforce Agency and reference job order #NC11054677. EOE. H-300-19078-078471. 99 temporary farmworkers needed for common ﬁeld labor in cucumbers and sweet potatoes in Sampson County, North Carolina, for Frym F Merino & Sons Harvesting & Hauling, Inc., with work beginning on or about 05/13/2019 and ending on or about 11/30/2019. The job offered is for an experienced farmworker and requires minimum 1 month veriﬁable work experience in the crop activities listed. The minimum offered wage rate that workers will be paid is $12.25 per hour, and piece rates may be offered depending on crop activity. Workers must commit to work the entire contract period. Workers are guaranteed work for 3/4 of the contract period, beginning with the ﬁrst day the worker arrives at the place of employment. All work tools, supplies and equipment are provided at no cost to the worker. Housing will be provided to those workers who cannot reasonably return to their permanent residence at the end of each working day. Transportation and subsistence will be provided by the employer upon completion of 50% of the work contract, or earlier, to workers who are recruited outside the area of intended employment. Applicants must provide documentation that they are eligible legally to work in the United States. Applicants should report or send resumes to NCWorks Career Center – Sampson County, 115 North Boulevard, Clinton, NC 28328 (910) 592-5756, or the nearest local ofﬁce of their State Workforce Agency, and reference job order #NC11055034. EOE. H-30019078-028411. 6 temporary farmworkers needed for common ﬁeld labor in ﬂue-cured tobacco in Johnston County, North Carolina, for Triple B Farms, Inc. with work beginning on or about 06/01/2019 and ending on or about 10/15/2019. The job offered is for an experienced farmworker and requires minimum 1 month veriﬁable work experience in the crop activities listed. The minimum offered wage rate that workers will be paid is $12.25 per hour. Workers must commit to work the entire contract period. Workers are guaranteed work for 3/4 of the contract period, beginning with the ﬁrst day the worker arrives at the place of employment. All work tools, supplies and equipment are provided at no cost to the worker. Housing will be provided to those workers who cannot reasonably return to their permanent residence at the end of each working day. Transportation and subsistence will be provided by the employer upon completion of 50% of the work contract, or earlier, to workers who are recruited outside the area of intended employment. Applicants must provide documentation that they are eligible legally to work in the United States. Applicants should report or send resumes to NCWorks Career Center – Johnston County, 8998 U.S. Hwy 70 West, Suite 100, Clayton, NC 27520, (919) 553-0953 or the nearest local ofﬁce of their State Workforce Agency, and reference job order #NC11056073. EOE. H-300-19079-412683. 8 temporary farmworkers needed for common ﬁeld labor in sod farming in Sampson, County, North Carolina, for Tri-State Turf of NC, LLC, with work beginning on or about 06/01/2019 and ending on or about 11/29/2019. The job offered is for an experienced farmworker and requires minimum 1 month veriﬁable work experience sod farming. The minimum offered wage rate that workers will be paid is $12.25 per hour. Workers must commit to the entire contract period. Workers are guaranteed work for 3/4 of the contract period, beginning with the ﬁrst day the worker arrives at the place of employment. All work tools, supplies and equipment are provided at no cost to the worker. Housing will be provided to those workers who cannot reasonably return to their permanent residence at the end of each working day. Transportation and subsistence will be provided by the employer upon completion of 50% of the work contract, or earlier, to workers who are recruited outside the area of intended employment. Applicants must provide documentation that they are eligible legally to work in the United States. Applicants should report or send resumes to NCWorks Career Center – Sampson County, 115 North Blvd. Clinton, NC 28328 (910) 592-5756, or the nearest local ofﬁce of their State Workforce Agency, and reference job order #NC11055597. EOE. H-300-19078-650054. 6 temporary farmworkers needed for common ﬁeld labor in strawberries potatoes, pickling cucumbers, and watermelons in Benson, North Carolina for Nicolas Bahena, farm labor contractor, with work beginning on or about 05/10/2019 and ending on or about 11/25/2019. The job offered is for a skilled farmworker and requires minimum 1 month veriﬁable prior work experience hand harvesting vegetables. The minimum offered wage rate that workers will be paid is $12.25 per hour and piece rate may be offered depending on crop activity. Workers must commit to work the entire contract period. Workers are guaranteed work for 3/4 of the contract period, beginning with the ﬁrst day the worker arrives at the place of employment. All work tools, supplies and equipment are provided at no cost to the worker. Housing will be provided to those workers who cannot reasonably return to their permanent residence at the end of each working day. Transportation and subsistence will be provided by the employer upon completion of 50% of the work contract, or earlier, to workers who are recruited outside the area of intended employment. Applicants must provide documentation that they are eligible legally to work in the United States. Applicants should report or send resumes to NCWorks Career Center – Johnston County, 8998 U.S. Hwy 70 West, Suite 100, Clayton, NC 27520, (919) 553-0953, or the nearest local ofﬁce of their State Workforce Agency, and reference job order #NC11038350. EOE. H-300-19065-212045. 350 temporary farmworkers needed for hand harvesting blueberries, and blackberries in Bladen County, North Carolina, for Francisco Valadez, Jr., LLC, with work beginning on or about 05/08/2019 and ending on or about 07/24/2019. The job offered is for an experienced farmworker and requires minimum 1 month veriﬁable farm work experience in the crop activities listed. The minimum offered wage rate that workers will be paid is $12.25 per hour and piece rates may be offered. Workers must commit to work the entire contract period. Workers are guaranteed work for 3/4 of the contract period, beginning with the ﬁrst day the worker arrives at the place of employment. All work tools, supplies and equipment are provided at no cost to the worker. Housing will be provided to those workers who cannot reasonably return to their permanent residence at the end of each working day. Transportation and subsistence will be provided by the employer upon completion of 50% of the work contract, or earlier, to workers who are recruited outside the area of intended employment. Applicants must provide documentation that they are eligible legally to work in the United States. Applicants should report or send resumes to NCWorks Career Center – Bladen County, 401 Mercer Mill Rd., Elizabethtown, NC 28337, (910) 862-3255, or the nearest local ofﬁce of their State Workforce Agency and reference job order #NC11041764. EOE. H-300-19072-091993. 4 temporary blueberry and grape machineharvesters needed in Bladen County, North Carolina, for Blue J Farms. Inc., with work beginning on or about 05/04/2019 and ending on or about 09/27/2019. The job offered is for an experienced farmworker and requires minimum 1 month veriﬁable prior work experience machine harvesting blueberries. The minimum offered wage rate that workers will be paid is $12.25 per hour. Workers must commit to work the entire contract period. Workers are guaranteed work for 3/4 of the contract period, beginning with the ﬁrst day the worker arrives at the place of employment. All work tools, supplies and equipment are provided at no cost to the worker. Housing will be provided to those workers who cannot reasonably return to their permanent residence at the end of each working day. Transportation and subsistence will be provided by the employer upon completion of 50% of the work contract, or earlier, to workers who are recruited outside the area of intended employment. Applicants must provide documentation that they are eligible legally to work in the United States. Applicants should report or send resumes to NCWorks Career Center – Bladen County, 401 Mercer Mill Road, Elizabethtown, NC 28337, (910) 862-3255, or the nearest local ofﬁce of their State Workforce Agency, and reference job order #NC11034234. EOE. H-300-19057-149862. For the latest in Community News, Business News, Sports and more, read The Goochland Gazette! This is YOUR Community. This is YOUR newspaper. The Goochland County Board of Supervisors will conduct a Public Hearing on Tuesday, April 16, 2019, 7:00 PM Goochland County Administration Building 1800 Sandy Hook Rd., Board Meeting Room Suite 250, Goochland, VA on the following item(s). The meeting is open to the public. All that certain tract or parcel of land situate, lying, and being in the County of Goochland Virginia, containing 10 acres more or less and is more particularly described on a plat dated April 23, 1897 and recorded in Plat Book 1 at Page 56 as follows: BEGINNING at a corner with the properties now or formerly owned by Joe Jennings and Peyton Cooper, N 23 W for 62 poles to a stone corner with the properties now or formerly owned by Daniel Walker and Peyton Cephas; thence S 84 W 30 poles to a corner with the properties now or formerly owned by Daniel Walker; thence S 23 E for 62 poles to a corner with the properties now or formerly owned by Joe Jennings and Daniel Walker; thence N 84 E for 30 poles to the point of beginning. And being the same property in all respects conveyed to Emily Walker from Thomas H. Lacy and Mary E. Lacy by Deed recorded in the Circuit Court Clerk’s Office of the County of Goochland in Deed Book 54 at Page 18. ORDERED that the parties herein and all Parties Unknown and/or whose location cannot be ascertained appear on or before April 26, 2019 in the Clerk’s Office of the Circuit Court of the County of Goochland, Virginia, and do what may be necessary to protect their interests in this cause. District 1 RZ-2019-00001 Application ﬁled by James E. Sumrell, III requesting zoning reclassiﬁcation of 1.25 acres from A-1 (Agricultural, General) to B-1 (Business, General), to operate an auto repair shop and towing service on Tax Map No. 6-1-0-54-A. The property is located at the northwest of the intersection of Old Fredericksburg Road and Broad Street Road. The Comprehensive Plan designates this area as County/State/Institutional. District 1 CU-2019-00003 Application ﬁled by James E. Sumrell, III requesting a Conditional Use Permit for an auto repair shop and towing service at 4746 Broad Street Road on Tax Map Nos. 6-1-0-25-T (.55 acres) and 6-1-0-54-A (see case RZ-2019-00001 – 1.25 acres). The properties are zoned B-1 (Business, General) and A-1 (Agricultural, General) and a total of 1.8 acres. The Conditional Use Permit is required by Article 16, Section 3(9) of the Goochland County Zoning Ordinance. The Comprehensive Plan designates this area as County/State/Institutional. District 4 RZ-2006-00013A Application ﬁled by Land Investments Associates, LLC requesting a proffer amendment to rezoning case RZ-2006-00013 to amend text requiring a cash proffer payment for a trafﬁc signal on Broad Street Road on Tax Map No. 47-1-0-78-0 located at 105 Broad Street Road. The property is zoned B-1 (Business, General), with proffers, and consists of 19.429 acres. The Comprehensive Plan designates this area as Commercial. District 4 RZ-1987-00013F Application ﬁled by PWC Properties, LLC, The Riverstone Group, LLC, Commonwealth Foundation for Cancer Research, and ELP Richmond, LLC requesting a proffer amendment to rezoning case RZ-1987-00013 to conform storm water facility requirements with current County regulations on Tax Map Nos. 59-5-0-1-0, 59-5-0-2-0, 59-5-0-5-0, and 59-3-2-W-8 located on Wilkes Ridge Parkway. The property is zoned M-1 (Industrial, Limited), with proffers, and consists of 150.563 acres. The Comprehensive Plan designates this area as Prime Economic Development. District 5 RZ-2019-00002 Application ﬁled by William Massey, III requesting zoning reclassiﬁcation of 3.082 acres from B-1 (Business, General), R-N (Residential, Neighborhood), and M-1 (Industrial, Limited), to B-1 (Business, General), with proffers, for development of retail uses on Tax Map Nos. 64-3-3-1-0, 643-3-2-0, 64-3-3-3-0, 64-3-3-52-A, and a portion of 64-1-0-41-0 (0.984 acres). The property is located at 12594 and 12608 Patterson Avenue. The Comprehensive Plan designates this area as Flexible with Residential and Prime Economic Development. District 4 CU-2019-00002 Application ﬁled by Hazel Fleming requesting a Conditional Use Permit to allow truck hauling operations exceeding three trucks at 1701 Manakin Road on Tax Map No. 58-1-0-11-0. The property is zoned A-2 (Agricultural, Limited) and is 3.46 acres. The Conditional Use Permit is required by Article 3, Section 3(31) of the Goochland County Zoning Ordinance. The Comprehensive Plan designates this area as Rural Enhancement Area. District 3 CU-2019-00004 Application ﬁled by John O. Brockenbrough requesting a Conditional Use Permit to operate a distillery at 2750 Maidens Loop on Tax Map Nos. 42-1-0-28-0 and 42-1-0-29-0. The property is zoned A-2 (Agricultural, Limited) and is a total of 7.09 acres. The Conditional Use Permit is required by Article 3, Section 3(36) of the Goochland County Zoning Ordinance. The Comprehensive Plan designates this area as Single-Family Residential, Low Density. District 2 CU-2014-00001A Application ﬁled by Chiknegg Productions, LLC, requesting to renew a Conditional Use Permit to operate a professional ofﬁce, restaurant, and commercial kitchen at 2753 Dogtown Road on Tax Map No. 29-10-0-B-0. The property is zoned A-1 (Agricultural, General) and is 1.15 acres. The Conditional Use Permit is required by Article 2, Sections 3(12), 3(25), and 3(26) of the Goochland County Zoning Ordinance. The Comprehensive Plan designates this area as Rural Enhancement Area. Full text of the above information is available in the County Administrator’s ofﬁce, Monday through Friday, 8:30 a.m. – 5:00 p.m. See Board of Supervisor’s Packet for further details. Call us at 746-1235 or Toll Free (877) 888-0449 to ﬁnd out more! Calendar continued from >5 at 1800 Dickinson Road in Goochland. Gum Spring United Methodist Church will be the site of the United Methodist Women’s upcoming Spring Craft & Bake Sale from 9 a.m. to 1 p.m. The sale will feature gifts and goodies for Easter and Mother’s Day, as well as crafts, handmade items and baked goods. All proceeds go to United Methodist Women Missions. The church is located at 191 Cross County Road, in Gum Spring (the big brick church near Rt. 250 off of 522. Mt. Gilead Purple Hearts and Relay for Life will be hosting a Stamp Card Bingo at 7 p.m. at the Hadensville Volunteer Fire Department Co. #6. The cost for adults 12 years and older is $10 for one bingo sheet of three games; for children under 12 years old, the cost is $2 for a bingo Wednesday, April 17 card. Food and drinks will be sold, and all benefits will go to This month the Ostomy American Cancer Society. Association of Greater Richmond will meet at 7:30 Mount Gilead Baptist p.m. in the Williamsburg-A Church will be hosting an room of Henrico Doctors’ Easter Egg Hunt from 11a.m. Hospital (enter at the Skipwith to 1 p.m. A hot dog lunch will entrance, 1608 Skipwith Rd.). be provided and all are wel- For more information, call come. The church is located Mike Rollston at (804) 232at 4768 Shannon Hill Road in 1961, or email him at agriva@ Columbia. comcast.net. Experience the best of Richmond’s dining scene in one delectable evening. Enjoy live cooking demos from local chefs and signature samples from the area’s top restaurants and food purveyors. Plus, enjoy wine, beer and spirits from favorites around the state and beyond.